Engineers have identified a way to shield astronauts riding the Ares 1 rocket from potentially dangerous vibrations caused by the launcher's solid-fueled first stage, according to NASA. Managers decided last week to incorporate an upper plane C-spring isolator module and upper stage liquid oxygen damper on the Ares 1 rocket to ensure astronauts inside the Orion crew module will not experience intense vibrations during launch, according to a posting on a NASA Web site. "The isolators work like shock absorbers to de-tune the vehicle and the LOX damper will counter the vehicle acoustic response by absorbing and disrupting the oscillation," said Jeff Hanley, NASA's Constellation program manager. "Together these options will give us added confidence in the tuning of the vehicle as we mature the Ares and Orion designs." The new equipment will damp out vibrations that could be transferred from the Ares 1 first stage to the Orion capsule. The shaking is caused by thrust oscillation, a phenomena in solid rocket motors that occurs as vibrations from burning propellant match the natural resonance of the rest of the vehicle, amplifying their effects. NASA has wrestled with the issue since 2007, but data from recent ground and flight tests have shown thrust oscillation in the Ares 1 is not as serious as initially feared. Engineers analyzed data from sensors on a static test of a five-segment motor in September and the Ares 1-X test launch in October and found no sign of significant vibrations that could reach the Orion module. "When we discover an engineering risk, like thrust oscillation, we tackle it with full rigor," Hanley said. "That's what this team has done with thrust oscillation. We assumed the worst when the problem was first discovered. The good news is there is no empirical evidence of problematic oscillations from our ground test of the first stage development motor or during the Ares 1-X first test flight." Despite the low vibration levels observed during the tests, adding the C-spring isolators and LOX damper is a "sensible addition" for the Ares 1, according to NASA. "Finalizing the thrust oscillation design now allows us to keep to our schedule and provides contractors specific requirements about what we need them to build," Hanley said. The Ares 1 rocket passed a preliminary design review in 2008 and is slated for a critical design review in 2011. 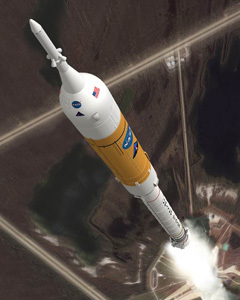 NASA envisions the Ares 1 rocket launching astronauts to Earth orbit beginning in 2015, but the agency's exploration plans are now under review by the Obama administration after a panel of experts commissioned by the White House found the program to be woefully behind schedule and over-budget. President Obama may opt to cancel the Ares 1 rocket, directing NASA to focus on a new heavy-lift launch vehicle geared for deep space exploration. Commercial providers would take over crew transporation to Earth orbit under such a scenario.